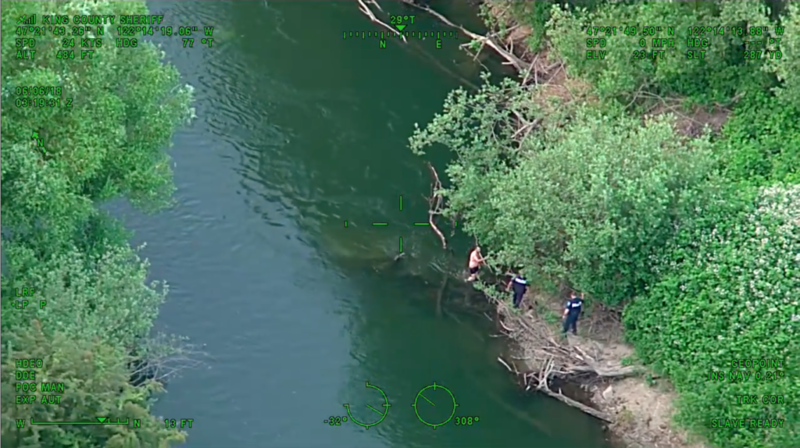 Below is video courtesy the King County Sheriff’s Office Guardian One helicopter, showing a hit and run suspect who pulled a gun on a victim, then ran and swam away from Auburn Police on Tuesday, June 5. Coordinates on the video display indicate the suspect swam north in the Green River, before finally surrendering to police in Kent near the 26300 block of 78th Ave S. (map below). At least one K-9 unit was used, along with numerous deputies on foot (and at times in the river).